SACRAMENTO, Calif. – The question has hung over Carmelo Anthony nearly since the first day he joined the New York Knicks, and it will likely be debated once again in the coming days. Can he and Amar'e Stoudemire play well – and win – together? There's no denying that Anthony has played his best, as have the Knicks as a whole, while Stoudemire has been sidelined the first two months of this season. But with Stoudemire now expected to return on Tuesday, Anthony is quick to roll his eyes at the thought that New York can't be a better team with the former All-Star forward back on the floor. "We need him," Anthony told Yahoo! Sports after the Knicks' 106-105 loss to the Sacramento Kings. "I know we are playing well, but the more bodies, the better, especially at this point where guys are doing well. …We are ready for him." 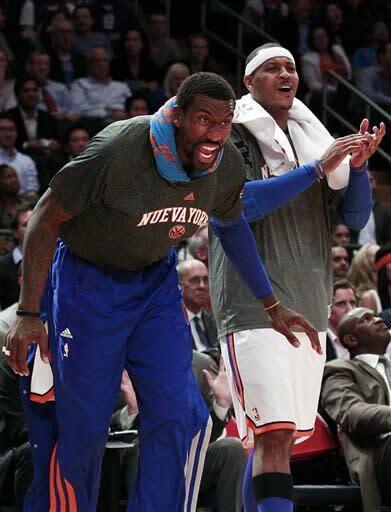 Stoudemire has yet to play this season after having surgery on his left knee in late October. He's expected to practice with the Knicks on Sunday and Monday. He completed a series of shooting drills prior to the Kings game, but didn't have much to say about his pending return. "I will be back soon," he said. "I'm not talking right now, but I will be back soon." The Knicks are riddled with injuries beyond Stoudemire. Anthony has missed two straight games with a hyperextended left knee. Forward Rasheed Wallace has missed eight straight games with a sore left foot. Guard Raymond Felton is out at least four weeks with a fractured right pinkie finger. Guard Iman Shumpert expects to return from knee surgery as late as February. Regardless, Knicks coach Mike Woodson said he expects to have enough players for Stoudemire to have a sound practice and scrimmage Sunday and Monday. "I'm going to put him through a full practice in terms of what we do and in terms of running up and down," Woodson said. "We will be banging some with him, too, just to see where he is. Hopefully, there won't be any setbacks and he will be ready to go on New Year's Day." Stoudemire recently worked out with the Knicks' Development League affiliate in Erie, N.Y. While he was a little rusty in the first practice, he impressed the Knicks' coaching staff and front office officials in the second workout when he drop-stepped and elevated for a hard dunk over one of the Erie players. Stoudemire is in good condition and ran the floor well during the workouts, but the Knicks still want to see him practice with them prior to clearing him. "He showed that he still has that bounce he's known for," said one source who saw Stoudemire work out. Anthony has started at power forward in Stoudemire's absence and is enjoying possibly his finest season, averaging 28.5 points and 6.2 rebounds. The Knicks also have won 21 games, most in the Eastern Conference. Yet, in their two seasons together, Anthony and Stoudemire haven't meshed well offensively while playing small forward and power forward, respectively. Stoudemire is expected to initially come off the bench when he returns and be given limited minutes. Anthony also is hopeful he'll be back on Tuesday. If Stoudemire eventually returns to the starting lineup, veteran forward-center Kurt Thomas would likely go to the bench. "I'll gauge it when he gets in a game and see how he's playing," Woodson said of how much Stoudemire will play. "He's not going to come back and play 30 minutes a game. That's impossible." Knicks center Marcus Camby finds the concerns regarding Anthony and Stoudemire laughable. Stoudemire "is hungrier than anything because he keeps hearing that he and 'Melo can't coexist on the basketball court," Camby said. "You have to give a guy like Amar'e a lot of credit because during that free agent period [in 2010] he was the only one that wanted to take a lot of responsibility and play under a microscope. Just how he handled things once 'Melo decided to come here … there has been no ego from what I have has seen. He wants to prove a lot of people wrong on the aspect that they can't coexist."